The proper design of a flat commercial roof has positive effects on the lifespan of the building as well as on the reduction of energy losses. Such a project must be carried out by Fort Collins commercial roofing specialists, who will take into account the particular attributes of the building. The main aspects related to the construction of a flat roof are the optimal design, the proper installation of thermal insulation, as well as the protection against the influence of the external factors. Everything must be based on precise calculations. The water vapor condensation is also an important aspect that determines the type of foil that must be installed as a vapor barrier and which also influences the durability of a flat roof. In the construction of such a roof system, it is recommended to use strong and quality materials for a final result that is durable and resistant to weather and traffic. 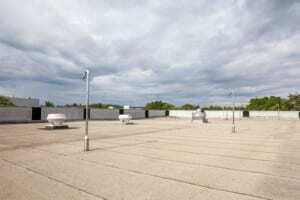 The immediate benefits of a flat commercial roof are the low costs and the efficient use of all the space available. On the roof, you can store air conditioning units, create a vegetation oasis and go even greener, by installing solar panels.